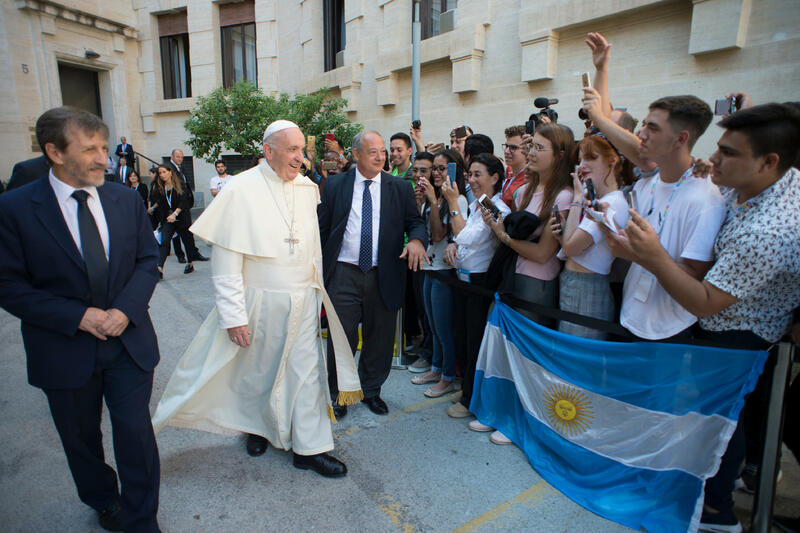 Pope Francis on May 11, 2018, visited the headquarters of Scholas Occurrentes in the Palazzo San Calisto in Rome to meet the new generation of trainers participating in a project that the Foundation is implementing around the world. During the visit, the Pope used a video link to inaugurate the new headquarters of the Foundation in Buenos Aires and the opening of a new center in Colombia. The Holy Father concluded the Third International Youth Meeting, organized in collaboration with the Italian Ministry of Education, University and Research, which opened in Rome on May 7. In addition, a group of world-renowned artists donated to Pope Francis a personal work done to promote the Scholas Art Program “Pintando Puentes”. Scholas Occurrentes Foundation, an international organization created by Pope Francis in 2013, is present in 190 countries and is currently the largest worldwide student movement. Its goal is to promote a culture of peace through educational networks.